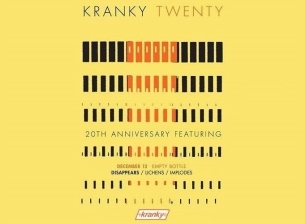 A night to celebrate 20 years of kranky Records. Tonight we welcome Chicago's DISAPPEARS back to our stage along with LICHENS, the solo project of ROBERT A.A. LOWE, and openers IMPLODES. Chicago staples DISAPPEARS are returning to play the Bottle for the Kranky Twenty Party and we seriously expect them to blow us away like they did at their record release show for the new LP Era on September 20th. Aptly named, the new album marks a brilliant new progression of their minimalist sound, in what promises to be their most unique and chilling release to date. After five years as a band, the group is at their most raw, reflective, and powerful. Era is described as being "abrasive, contemplative, and paranoid - it's the sound of the void looking back." We’ve long been a fan of DISAPPEARS’ crunchy, propulsive, and atmospheric wall of sound and know how perfectly engaging they are live. Long-simmering and otherworldly, ROBERT AA LOWE'S multi-formatted LICHENS project is captivating and expansive and each live show is a spectacular unique and individual event that never attempts to duplicate any previous performance. Formerly the bassist in long-gone Chicago outfit 90 DAY MEN and a sometimes-collaborator with OM, LICHENS loops seemingly endless layers of wordless vocals and avant-folk fingerpicking to create otherworldly sheets of deep-listening drone. IMPLODES have been rocking our brains consistently since their 2009 inception and tonight they return behind the efforts of their new full-length, Recurring Dream, out this past April on - you guessed it - Kranky. The album retains the crushing qualities of their debut record while bringing the distant melodies and submerged rhythms out of the ether and into the light of day. Continuing to explore the deep, dark places of human existence, IMPLODES channel the sounds of earth and space and deep water and simple machines, nudging listeners awake in the most gently brutal way possible. Looking for a cheap taxi the night of the show? Download the Taxi Magic app on your smarty-pants phone. Then, purchase an advance ticket to tonight’s show and we’ll give you a code for $10 off your first cab ride!